When can we use Integrative Thinking? A student argues with a classmate at recess; back in class, she asks that classmate to sit down to help her understand just why they disagreed. A teacher, struggling to refresh her practice after decades in the classroom, stops thinking about her classroom as place to teach and starts to think about her classroom as a think tank. Finally, a principal, working with her team in a brand new way, helps her teachers move past the age-old scheduling challenge between rotary and single-subject timetabling. Each of these outcomes was unexpected, yet unsurprising. That student, teacher and principal found themselves in similar situations, in conflict, stuck between opposing views of the world. Integrative Thinking gave each one a new way to think about their situation and a pathway to a better answer. Integrative Thinking is at once a mindset, a methodology and a pedagogy for problem solving. Fundamental to the practice is the ability to see our ideas for what they are — our own interpretation and simplification of the world around us — and only one piece of a much larger puzzle. In recognizing that our ideas only tell a part of the story, Integrative Thinking forces us to consider how other people interpret the same situations — especially when those other people have a different and opposing point of view. Like the student, teacher and principal above, a capacity for such consideration empowers Integrative Thinkers to uncover the unexpected and to create new worlds. Integrative Thinkers start from a place of consideration — an openness to learning from other people’s ideas, especially those ideas that conflict with our own. This mindset allows them to approach challenges and problems from a unique position; where conventional thinkers opt to choose between points of view, Integrative Thinkers instead consider the value inherent in opposing models from more than one perspective. Understanding how each point of view is valuable lets Integrative Thinkers begin a problem solving journey with a rich menu of possibilities. After diving into opposing views of the world, Integrative Thinkers make sense of the tension between the ideas and reframe the problem to be solved in light of what they now see differently. Integrative Thinkers linger in this amorphous sense-making phase, diverging and converging as the situation requires and the tools demand. With a clearer perspective on the problem to be solved, Integrative Thinkers then explore possibilities and iterate on prototype solutions. The tools of Integrative Thinking provide the structure and pathways for ideation, guiding thinkers toward fresh outcomes. Unexpected outcomes can be uncomfortable; new ideas can seem unorthodox and dangerous if untested. So, at the end of the journey, Integrative Thinkers engage with others to test and experiment with the prototype solutions, building excitement for bringing idea to action. If you want to be as successful as Jack Welch, Larry Bossidy, or Michael Dell, read their autobiographical advice books, right? Wrong, says Roger Martin in The Opposable Mind. Though following best practice can help in some ways, it also poses a danger: By emulating what a great leader did in a particular situation, you'll likely be terribly disappointed with your own results. Why? Your situation is different. When it comes to our hardest choices, it can seem as though making trade-offs is inevitable. But what about those crucial times when accepting the obvious trade-off just isn't good enough? What do we do when the choices in front of us don't get us what we need? In those cases, rather than choosing the least worst option, we can use the models in front of us to create a new and superior answer. This is integrative thinking. At the I-Think Initiative, we work with educators to bring Integrative Thinking and approaches to innovation to classrooms. Fundamentally, we see our role as helping teachers to explore their stance in the classroom by providing tools that they can use to create experiences for their students. Our tools foster a mindset that is ready to explore different and conflicting ideas. 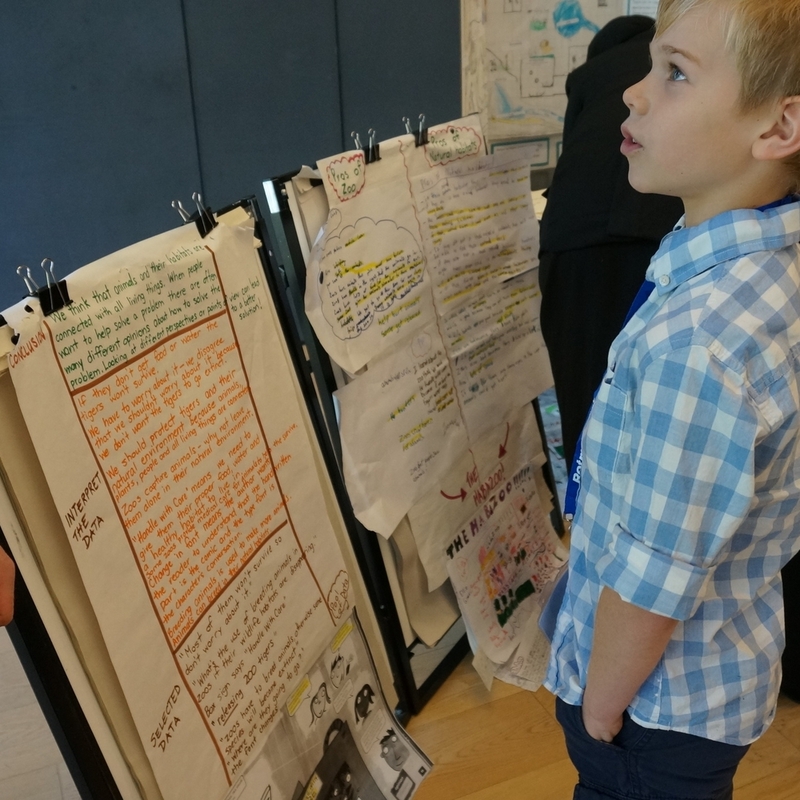 The tools help students to be clear about their own thinking and outline how the ideas of others can be used to enhance existing points of view. With deepened understanding comes renewed creativity, bolstered by a set of tools to stretch student thinking into unexpected places. Understanding opposing models is fundamental to enjoying and leveraging Integrative Thinking. We outline a framework for exploring the logic and benefits of models in tension. Making our thinking explicit let's us play with our thoughts, expand them, adjust them and make them robust. We can better collaborate and enjoy comfort with complexity. Using a framework inspired by design thinking, we create an environment for our students to collaborate, build connections, and utilize constraints to their advantage. We can foster creativity in every classroom. There is no sure-fire recipe to resolve the tension between opposing ideas or models, even less so when your task is to solve a wicked problem. But, there is a process you can follow that will give you a better shot at coming to a great, integrative answer. This process is a heuristic – a rule of thumb to help you as you work through the problem. There are four key stages, with steps within each stage. The first step requires the Integrative Thinker to lay out her models - this step often involves turning the issue at hand into a two-sided dilemma, where each side is an extreme and pure expression of, and solution, to the core issue. Going to extremes helps us avoid starting our problem solving process from a place of compromise. We then set out the two ideas with enough resolution that a friend could understand the essence of each model. Lastly, we identify the three key players important to our issue and articulate how each player benefits from each model. The second step asked the Integrative Thinker to consider the models together - a departure from the individual model analysis in Step 1. Integrative Thinkers must now explicitly hold the models in tension, exploring connections and differences. We provide a set of six questions for the Integrative Thinker to consider during this step in the process. With the incorporation of select tools (causal modelling, for instance), we often see Integrative Thinkers reframe the problem in this step, as new information is discovered and new connections forged. As the Integrative Thinker emerges from the weeds of Step 2, she now moves to building prototype integrative solutions that resolve the tension between the two models - and create better answer than would have been possible before. While we provide guided questions to promote possibility generation, this step is all about exploring what better answers might look like. Finally, a new idea! The world often demands, however, that we "prove" our new-to-the-world idea before endorsing it. This last step asks "what would have to be true" for our solution to work and be implemented. Considering our solution in this frame explicitly generates testable conditions that help all problem solvers and decision makers alike gain confidence to move from idea to action.